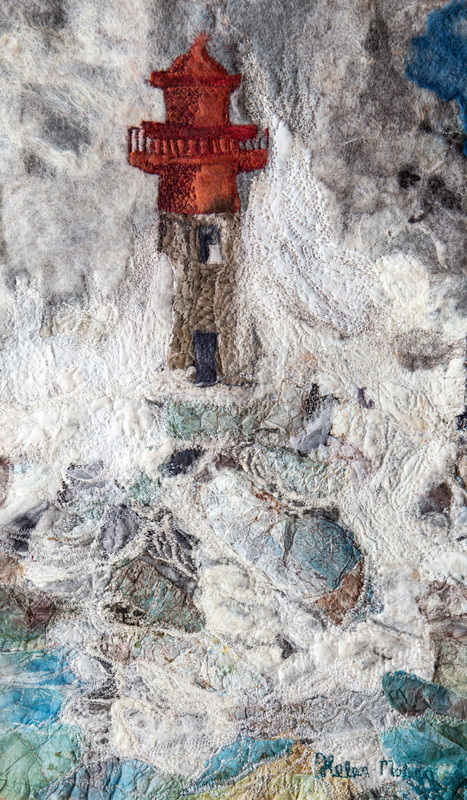 Lighthouse in Stormy Sea, is a Helen Melvin original landscape in naturally dyed felt, fabric and paper and machine stitch. The Lighthouse in stormy sea is an unique Helen Melvin Landscape made with a method of wet felting developed over twenty years five and combines fine merino wool fibres with silk fabric and fibres to create movement and texture. On top of this layers of felt, fabric and papers are added with stitch or stitch alone which is also used to emphasise movement. I have been fascinated by lighthouses for many years. My original inspiration came from a picture in the Guardian of PorthCawl Lighthouse being overwhelmed by waves many years ago but it took time to develop the technique that allowed me to make a fine but very firm felt which could be used for the Lighthouse and to be felted into the sea background. Waves are felted in with textured silks, but stitch adds additional emphasis and so do the layers of silk fabric and dyed papers stitched onto the surface. This picture took nearly six months of works as for periods I merely looked at it pinned to my wall before carefully adding more stitch or more fabric. Mounted and framed with handcrafted frames from the Cathedral Framers in St Asaph, each picture is sent in a hand built wooden frame and despatched tracked and signed for by courier world wide.